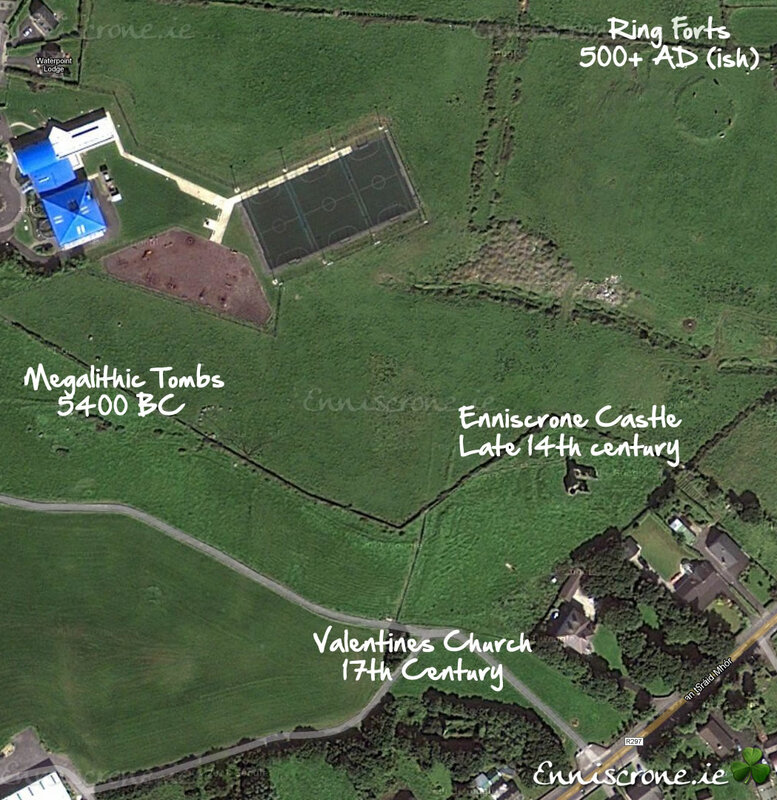 The first recorded reference to Enniscrone dates back to the 11th Century. The parish, known as Kilglass, extended far beyond the boundary of Enniscrone town itself, encompassing much of the surrounding hinterland. This region around Enniscrone was the centre of power of the principal clan from this part of Ireland – the O’Dowd’s. They were a maritime power of considerable ability in the 12th and 13th centuries. Enniscrone displays a host of archaeological remains, which reveals its rich heritage extending from the megalithic age. The oldest recorded artefacts in the area are the scattered ruins of two possible passage tombs, dating from approximately 2500 BC, which are sited on a hill west of the castle. Ancient ring forts, souterrains and stone formations are also evidence of the cultural heritage of Enniscrone and indicate a long settlement history. There are many derivations of the name ‘Enniscrone’ such as Inishcrone, Inniscrone and the Irish equivalent Inis Crabhann. An early written reference to Enniscrone is from a poem dated 1417, where the name is spelt “Enniscrone”. The name recorded locally for the little stream in the Castle Field is the “Inis”; it is possible that the derivation of the name came from this. The modern development of Enniscrone appears to date from the 1840’s. The pier was built between 1884 and 1887 and a coastguard station was also erected at this time.